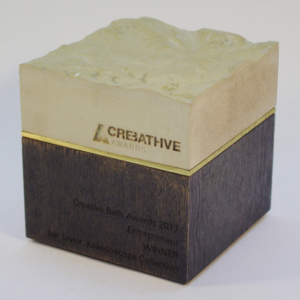 These awards were designed for the organisation ‘Creative Bath’, an organisation that seeks to connect the creative industries of Bath. 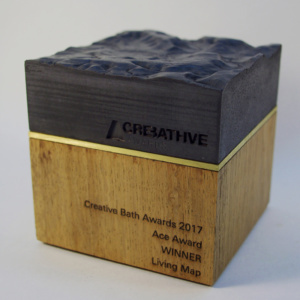 I designed and made 18 of these awards for the inaugural Creative Bath Awards in 2017. The design of the awards references the local geography, materiality and historic creativity. 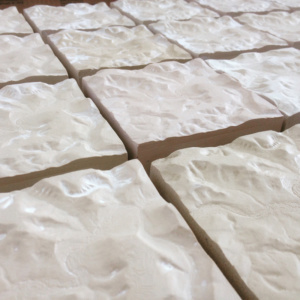 The top section is a true to life 3D topographic map of Bath and the surrounding area, This was created with a 3D printer and used to make a mould, into which I cast the map with crushed Bath stone and Jesmonite. The brass section references the history and creativity of industry in Bath, One of the primary pursuits of the J.B. Bowler company (as featured at the Museum of Bath at work) was their brass foundry. Amongst other things, they produced cast items in brass for the local industry and businesses of Bath for nearly 100 years between 1872 – 1969. The award category and winner was laser etched onto each award. The ‘Ace’ award was a special award for the overall winner and I used black pigment and unfinished oak to make an inverse colour scheme.